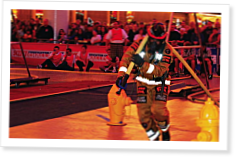 The Firefighter Combat Challenge is about power and functional movement. So is CrossFit. Mike Warkentin talks to Dr. Paul Davis and elite firefighting athletes about what that means for the future of fitness. Dr. Paul Davis isn’t describing CrossFit. He’s talking about the Firefighter Combat Challenge, an event he invented in the ʼ70s to predict the success of the men and women who run into burning buildings and carry out the people trapped inside. It took several years for Davis to discover that his challenge was more than just a way to measure true fitness—it was a way to encourage it. Davis says his sport is about power—moving a lot of mass in a short time. Sound familiar? Given that so many of his athletes speak so highly of CrossFit, Davis has been compelled to research the program and its methodology. After all, he sees its efficacy at every Challenge. “The proof is in the pudding, because it’s pretty evident that a lot of our standout athletes regularly engage in (CrossFit),” he says. Does a sun salutation have anything to do with Cindy? Mike Warkentin talks to a few CrossFitters who see a link between asanas and Angie. Kasper Hansen, a member of the Danish armed forces, rekindles his love of training and sport through CrossFit. I would like to see a Great Crossfitter give the challenge a try. Its a great test, I am just curious to see what they think of it. Maybe Dr. Davis would be willing to let a Crossfitter give it a shot at one of the competitions. Great article, good to see the Combat Challenge getting some print. Dr. Davis recently came out to Colorado (CrossFit SMAC) to validate our departments incumbent test; the Combat Challenge. In a group discussion of the test and preparation we mentioned we had already implemented CF into our department and that it was our means to get firefighters fit not only for the test but the job. His response was that CF was dangerous and those who do it are extremist! I am glad to see he may come around. When was Dr. Davis in Colorado, Ryan? For me, the most telling comment was the last one in the abstract above: "The proof is in the pudding." As an aside, I'd suggest that if CrossFit was indeed extremist, wouldn't it then be ideally suited for anyone with an "extreme job"? Maybe something where you have to carry a 350-lb. man down 10 flights of stairs with no warm-up and a fire at your heels? As for dangerous, CrossFit is no more or less dangerous than the Combat Challenge. I'm sure Jeff Leonard, Brandon Cunningham and Chris Cerci would be able to speak to that. I have to agree with Micheal above. How much more dangerous is it than RUNNING up and down 6 flights of stairs full dressed in gear, running around fire hydrants on slippery ground or quickly dragging a 170lb dummy backward (without looking) 100ft. I am thinking that EACH sport has an equal oppurtunity for injury. How would that graph look, there are soo many people doing CF (CORRECTLY) and are smart enough to scale their workouts that I am pretty sure that the list of injuries for CF as a whole is probably FAR less as compared to any other injury catagory. On a last note, I am speaking from an UNTRAINED perspective. I do not have CF equipment, I have not been trained and I am smart enough to scale my workouts in order to minimize the risk of injury. I am ALSO a HUGE fan and one time competitor of FFCC. In closing I will have to say I LOVE both sports (CF & FFCC), so I have a small perspective of each. As a competitor in the firefighter challenge I sought out a training regimen that would equally punish me the way some of the challenge course does. I was lead to Crossfit Pittsburgh after consulting with a couple of top challenge athletes, one of them being Brandon Cunningham, the current world champion. What I found was like nothing I had ever tried. I was hooked, call me crazy but the pain was almost identical. I still do course work to help with technique, but the majority of my workouts are crossfit based pricipals. At 42 years old I am with a doubt in best shape of my life. Thanks Crossfit and Mike for a great story. That should have read WITHOUT a doubt. I should have proofread a little better. I think Dr. Paul has started coming around because all the top Challenge athletes train crossfit (like some of ya'll already said). It acclimates your body to the anaerobic hell that the challenge puts you through. I am now in my second season with the challenge and personally have talked to most of the teams that are from the south. Almost every single one incorporates crossfit into their training. So much of knocking seconds off your course time is technique and familiarity with the movements. But everyone gets to that point where they can only improve by getting more cardiovasculary sound. That's where crossfit comes in. I would love to one day see crossfit and the challenge work more closely together. As for a crossfitter doing the challenge, I really would like to see it. Full bunker gear on air will test any athlete. Can't remember the date of the site visit, it was sometime mid April? The group conversation with Davis started going into how to train for the FFCC and CrossFit came up. The following is the conversation that took place between one of my trainers and Dr. Davis. "Davis brought up that he thought CrossFit was dangerous and how they (CrossFit) is being sued for someone’s rhabdo. I mentioned he should really look into what he's talking about before making those statements. Davis returned fire with a bunch of BS doctoral science and big words on ATP and macro cycle something or other and how crossFit WOD's exceeded the effective training duration at that intensity and broke down the body without ever letting it recover... yadi yadi ya." "I said what about Brandon Cunningham and the black box? Conversation moved on." Hope that helps, either way we have about 70% of our personnel doing CF, 10% who dabble with it. We have seen the results and believe! The interview from this article was done shortly after the CrossFit Games, near the end of July. Dr. Davis seemed very interested in CrossFit because his athletes were speaking so highly of it, and because their results were speaking even more loudly. He admitted that he didn't know a great deal about CrossFit but was very interested in researching its methodology. I sent him a package of info to get him started. Dr. Davis' thoughts about power and functional movement are very close to the things you'll read in the CrossFit Journal and hear at the cert, so I think he'll find it to his liking. Coach, I've really enjoyed these articles driving home the efficacy of the 100 words of fitness training preparing for unplanned, intense situations in combat, fires, wrecks, and lifesaving. Thank each of you who serve and prepare! I have to say as a Firefighter Combat Challenge competitor that crossfit is one of the best ways to train for the competition. I feel that CF helps prepair your body for the pain your about to go through doing the challenge. I would love to see some of the top CF'ers do the challenge and see how they do, and more importantly how they feel when they are done. I have to agree with Jeff that it is great to see the Firefighter Challenge get some press, since so many top firefighter competitors are also great crossfit athletes. I am hoping that my new found love of CF will help when our team goes to Las Vegas in November to defend our World Title. Great article Mike! Thanks to Dan MacD and Mike G of CrossFit ATL for getting me into to it!.....as well as the crew at CrossFit Augusta for always pushing me. anyway Brandon, i just wanted to say congrats on getting your own CF affiliate!! i cant think of anyone else i would rather see lead a group of crossfitters! i would love to come down and check it out some day!